Disclosure: We received a product in exchange for our honest review. All opinions and experiences are our own and may differ from yours. We hold no responsibility for the fulfillment of the prize. view) and of course give your pet treats when you are away from home. treat that is smaller than 1 inch. 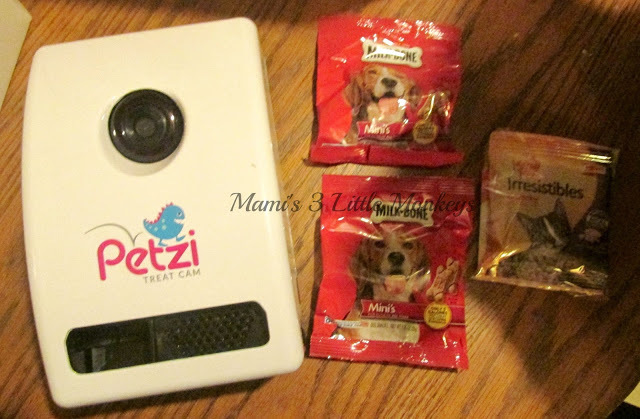 Read our full review of Petzi here. One lucky reader will win a Petzi Treat Cam of their very own! This giveaway is open to US/CAN, must be at least 18 years of age at the time of entrance. Void where prohibited. To enter, simply complete as many entries in the form below. Winning entry will be verified, winner will be notified via email and will have 48 hours to respond or a new winner will be chosen. Good Luck! I like the night vision feature. We have three dogs. It would be neat to see what the little devils (cats!) are up to when I’m out! The camera has the night vision feature. I only have one kitten that had showed up on my doorstep a few months ago. I love that this has a night vision camera. Our two cats get at it at night and I would love to see what is really going! I love that it has a wide angel camera with night vision! This would have been great to have while we were just away at Disney World, we used a web cam to look in on our cats, but it would have been great to be able to give them treats.We also have two dogs, and this would also be great for checking on them while we are gone for the day.